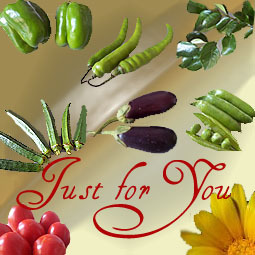 A Sindhi’s love for Lotus stem dates back to pre-partition era and our forefathers loved the nutty flavored, woodsy looking, stringy/hairy stem of Lotus flower so much that they started cultivating it here in India, around their homes, and hence this Lotus stem or Bhee is still found mostly in Sindhi dominated areas.Those who grew up in areas like Ulhasnagar, Chembur, Khar, Pune, Indore or such other Sindhi populated places, might have tasted, the stuffed Bhee tikki. 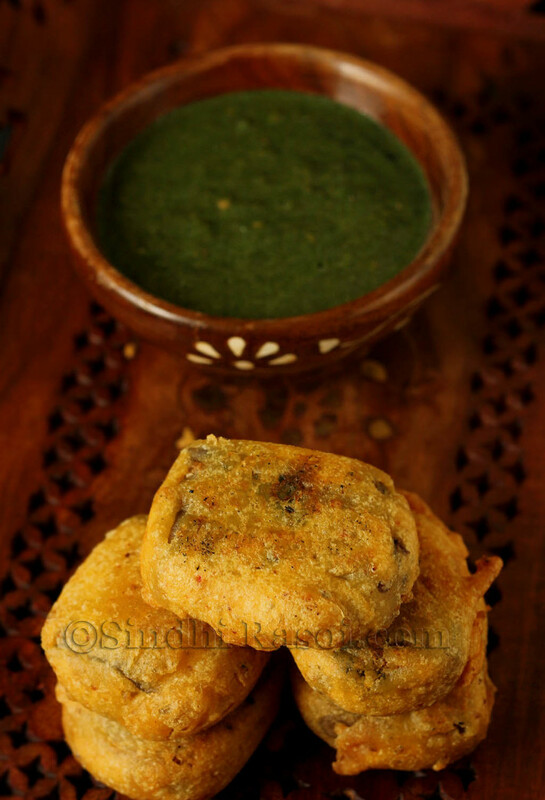 A signature Sindhi snack, Bheeyah Ji tikki, is now hardly available in Sindhi eateries and is seldom cooked at homes. I still remember those days when we used to buy this tikki from Pakora vendors.The shop of Ballu Uncle in Ulhasnagar camp 4, was so popular because of his Bheeya ji tikki, that it became a landmark for areas around, and the lane opposite to his shop, was known by his name. In the evening, the hot crispy, spicy stuffed lotus stem tikkis, with green chutney, attracted not only the locals but also the people from far and wide.The Man is no more, neither is his shop, but the taste of Bhee tikkis lingers on. The lotus stem must be cleaned properly, boiled and then stuffed with the mixture of greens. You can use regular garlic, but this time I used fresh green garlic, that imparts more verdant flavor. 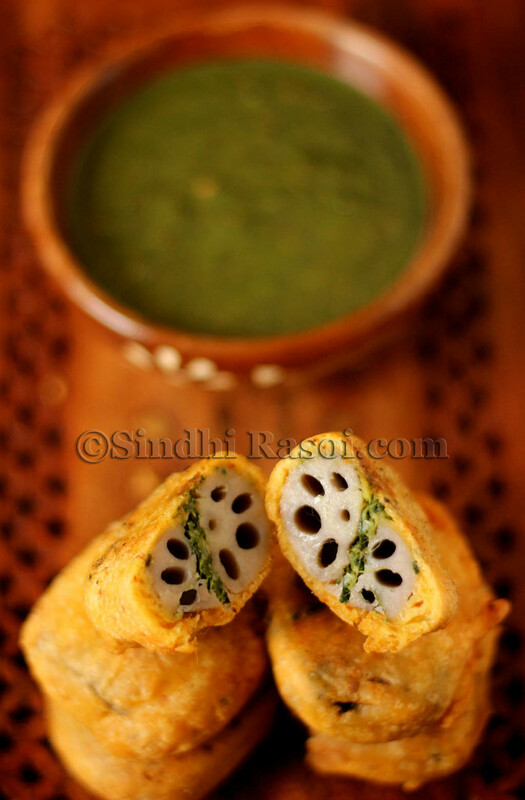 The besan batter coated tikkis could be fried completely at one go, if you wish to make it less sinful. But Sindhis have this evil affinity for double frying their snacks for the sake of enjoying crispy and crunchy munchies ;-). So pick your choice ! Wash thoroughly the lotus stem and cut it into pieces, each about 2 inches long. Now boil these in a pressure cooker with some salt and water, till almost done. 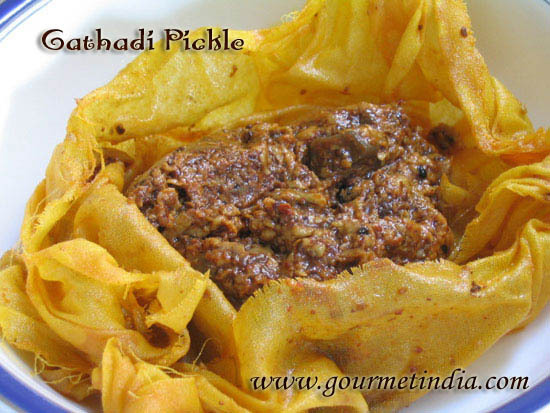 Depending upon the quality of lotus stem, the time to cook varies.To soften the stem faster add few drops of oil or sindhi papad while boiling. The lotus stem that I used, was fresh and of good quality. I put it on low flame for 4 minutes after one whistle (of pressure cooker) and it was just perfect to stuff and fry. Meanwhile mix chopped coriander leaves, green chillies and chopped fresh garlic in mortar-pestle (Hamam Dasta) and pound it to obtain a coarse mixture.Please do not grind it. Take each piece of boiled lotusstem, slit it vertically and stuff the mixture properly. Dip each stuffed lotusstem piece in batter and coat it properly. 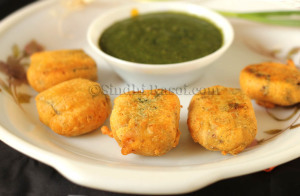 Serve this Bheeya ji tikki with coriander and mint chutney or any chutney of your choice. Aloo Tikki, sweet potato tikki and chickpeas or rajma tikki and veg tikki, I have heard about them but Lotus stem in tikki. This is quite different. Love the unique recipe.